We can’t count the number of times we’ve read a recipe for something or other that calls for fresh herbs, gone to the grocery store to get everything else the recipe calls for all the while thinking that we have some fresh herbs in the fridge only to get home and find them dead, moldy, and sometimes slimy if we have them at all. I’m sure we’re not the only home cooks this has happened to. We live in a small 700 square foot apartment with only a fire escape as our backyard. In past years we have tried growing vegetables and flowers everywhere we could: from the rooftop to the small little plot of dirt behind the building, to every little space that the sun hits in our apartment. Sometimes we’ve had success, but mostly we end up tossing the pot, along with the dead plant and its dirt onto that shady little strip of dirt. 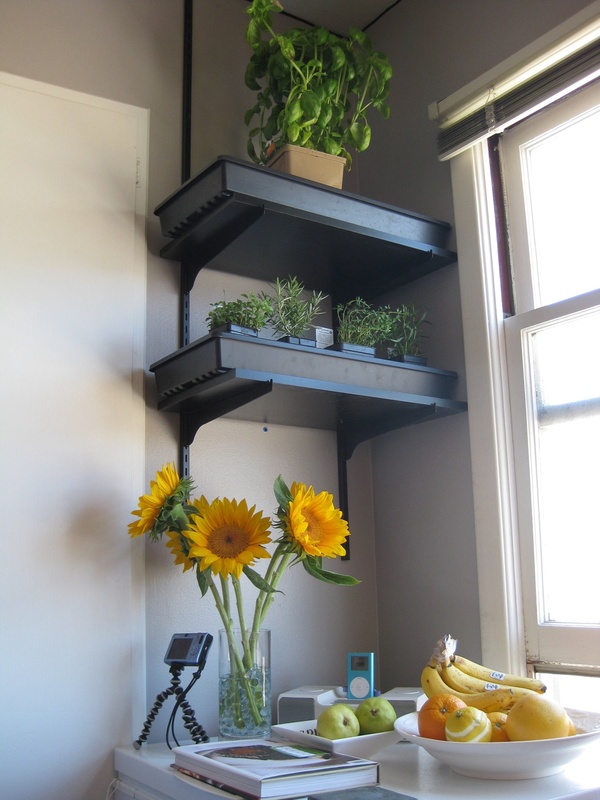 Last year we put up some shelves in our breakfast nook for our hibernating orchids so that they could chill out. We had grand illusions of year-long flowering orchids placed strategically throughout our apartment making it look more sophisticated, something out of Architectural Digest, but we only ended up with a corner full of dead looking plants. After years of experimenting with the right plants, herbs, flowers, etc. we’re giving it one more try. We know that we can grow basil and cat grass in the window, so with the shelves in place we’re going to try out some other herbs for the summer – a little parsley, sage, rosemary and thyme garden, with a few others thrown in the mix. Through our experimentation with seeds we know that it’s possible to start them in our apartment, but we think we can do a better job with plants that are well established and more mature. We’ll keep you posted on the results.